The Thirty-second Regiment Indiana Volunteer Infantry, also called the First German, was composed of German immigrants (many of themTurners) and the descendants of local German settlers. Several of the ten companies which comprised the 32nd Indiana were formed by Turner Clubs from all over Indiana--Indianapolis, Madison, Lafayette, Fort Wayne, Terre Haute, Aurora, Evansville, Lawrenceburg--of Louisville, KY and Cincinnati, Ohio. On August 24, 1861 these volunteers were mustered at Camp Morton, Indianapolis. August (von) Willich, the regimental commander was born November 19, 1810, in Braunsberg, Prussia. He entered the cadet house at Potsdam when he was twelve years old and, at fifteen, the military academy in Berlin. By the age of eighteen, he was a lieutenant in thePrussian army and a captain three years later. Willich fought with revolutionaries in Baden in 1848, then fled to the United States, where he settled in New York and worked as a carpenter in the Brooklyn Navy Yard. In 1853, he edited a labor newspaper he founded in Cincinnati for the German speaking community. At the request of Governor Oliver P. Morton, he assumed command of the Thirty-second Indiana. Willich drilled his regiment, to a high degree, in German. He earned the reputation of disciplinarianand would direct his regiment by Prussian bugle calls on the parade ground and battlefield. Rebels, more than 3,000 strong, were beaten into flight from the battlefield at Rowlett's Station by 500 German soldiers. Lieutenant Max Sachs, leading Company "C" on the Union left during the battle, was the one officer among the thirteen mekilled. Surrounded by Texas Rangers, Sachs and four of his men were struck down in a blaze of gunfire after defiantly choosing to fight rather than to surrender. In the days following the engagement, Private August Bloedner of Company "F," 32nd Indiana procured a large tablet of outcrop limestone from the fields around the Green River town. He expertly carved an account of the battle in German, including the names, places and dates of birth of those men killed. Bloedner surmounted the monument with a recess in which he placed patriotic symbols including an eagle clutching a brace of cannon flanked by National flags. The regiment placed the memorial to their comrades at the hilltop burial site west of Munfordville, KY on the north side of the river sometime in January 1862. In response to directives to gather all Union dead to National Cemeteries the remains, along with the monument, were removed from Munfordville to Cave Hill in June 1867. The monument was mounted upright on a commemorative base stone with the English inscription, "In memory of the First Victims of the 32. Reg. Indiana Vol. Who fell at the Battle of Rowlettd [sic] Station Dec. 17, 1861." 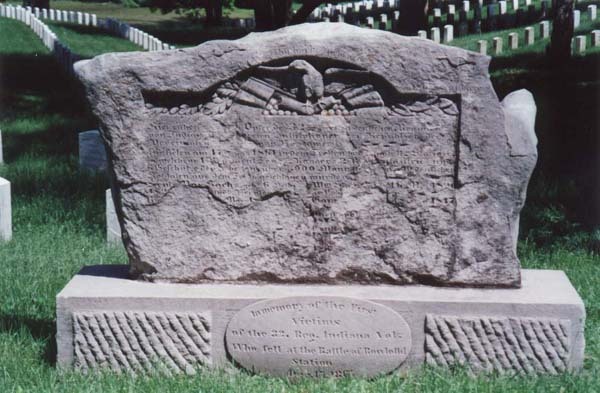 On February 2, 2002, John M. Trowbridge of the Kentucky Military History Museum at Frankfort, directed a grave side memorial ceremony at Cave Hill National Cemetery, located at 701 Baxter Avenue, Louisville, Kentucky. Reenactors of the 32nd Indiana and the Bluegrass Mountain Artillery of Fort Duffield Camp #1 were on hand to honor those men killed at the battle of Rowlett's Station on December 17, 1861. A posting of the colors, invocation, and dignitary remarks culminated with a military salute and benediction. At 1 p.m. that afternoon a symposium examined the history of the monument, the battle and the regiment, at the German-AmericanClub located at 1840 Lincoln Avenue in Louisville.